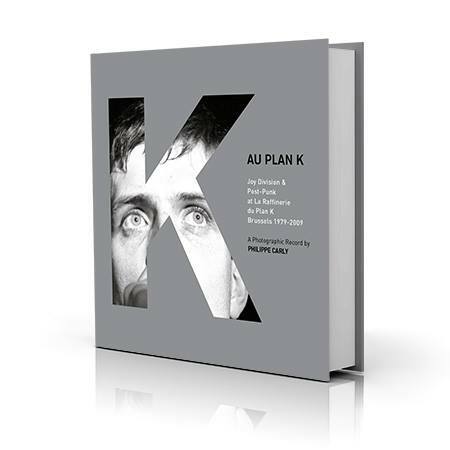 Two sets of à;GRUMH… photos plus memorabilia text by S3 in “Au Plan K” book by Philippe Carly. One of the most important period that Philippe Carly has made photos of, was the 1977-1985 mythical decade including punk and new-wave movements, and also including the carreer of one of the most important bands of all times : Joy Division. After a first book released a few years ago “New Wave Photos”, Philippe Carly has decided to release a master-piece book based on the pictures he made at the legendary “PLAN K” music venue that existed in Brussels for less than ten years, in an old factory, and where most of the important bands of that period have played. The book was lauched through a crowdfunding campaign which ended succesfully and allowed the book to be printed and released in january 2017. It’s a huge book, classy photo paper, big size. It’s amazing. There are pictures of each and every gig that Philippe Carly saw at the Plan K. The quality of the pictures and the printing are of very first class. The book contains also testimonies and memories of people and musicians who frequented the venue, and one was written by S3 eVETS who talks about his memoirs of the legendary concerts in the PLAN K and his feeling about this exceptional place. Also two of the à;GRUMH… concerts who took place at the Plan K are displayed in the book, pictures of the 1983 and 84 concerts given by à;GRUMH… in this mythical palace of modern music, which helped build à;GRUMH…’s live reputation years before we had released any record! An exhibition of pictures from the book has taken place at Play It Again Sam!’s building in Brussels in January 2017, including one picture of S3 (thin and with hair, hurgh!) banging drums at the 1983 gig. We are very proud of this participation to the book and of our presence at the exhibit. This entry was posted in à;GRUMH... on 2017-01-27 by SΔ3 eVETS.